Discussing the Protect Life Service are Colin Loughran, Service Manager at AMH MensSana; Nuala Quinn, Protect Life Coordinator at the SHSCT; Seamus McCabe, Protect Life Community Development Worker for the Southern Area; and Deirdre McNamee, Health & Social Well-Being Improvement Senior Officer at the PHA. 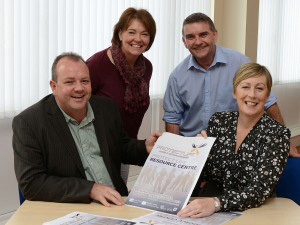 AMH MensSana and PIPS Newry & Mourne provide the Protect Life Service, helping individuals and community groups with suicide and self-harm prevention in Armagh, Banbridge, Craigavon, Dungannon and South Tyrone, and Newry and Mourne. The Protect Life Resource Service will also have a signposting service, providing individuals and community groups with a valuable point of contact and sources of support regarding suicide and self harm prevention and mental health. The Service is funded by the Public Health Agency. Mr Loughran is also Chair of the Southern Area Protect Life/Mental Health Promotion Community and Voluntary Forum, says that suicide presents a complex and deeply concerning challenge for our society and is a challenge that everyone must respond to comprehensively and collectively. For further information on the Protect Life Resource Service in Armagh, Banbridge, Craigavon, Dungannon and Newry and Mourne, contact AMH MensSana on 028 3839 2314 or PIPS Newry and Mourne on 028 3026 6195. The provision of mental health services through a stepped care model, with most services being provided in the community by voluntary and community sector partners and community mental health teams is a key theme of the Transforming Your Care report.